Oh what a happy day! 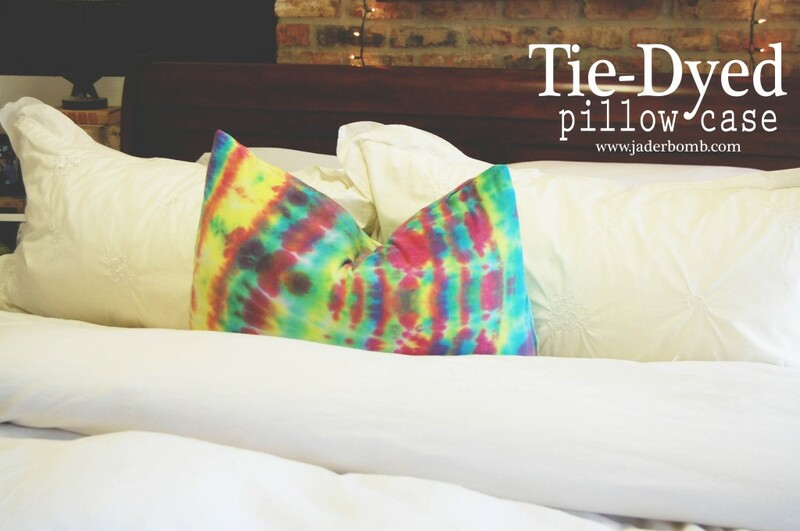 I had so much fun making this pillow and I know you will too. It’s obvious I love doing crafts that an adult or child could do by themselves or possibly together. 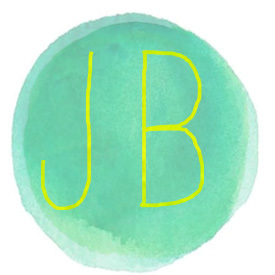 I think there is something special that happens when you craft with your little ones. Trust me, they remember it! I can’t tell you the last time I Tie Dyed something. I didn’t want to make a “shirt” because that is what everyone does. 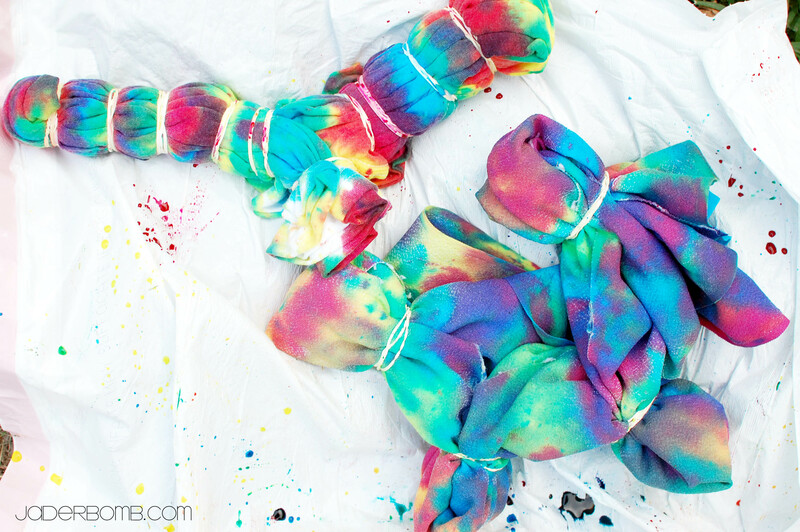 Making a basic tie dyed pillow sounded like the thing that would put a smile on my face! 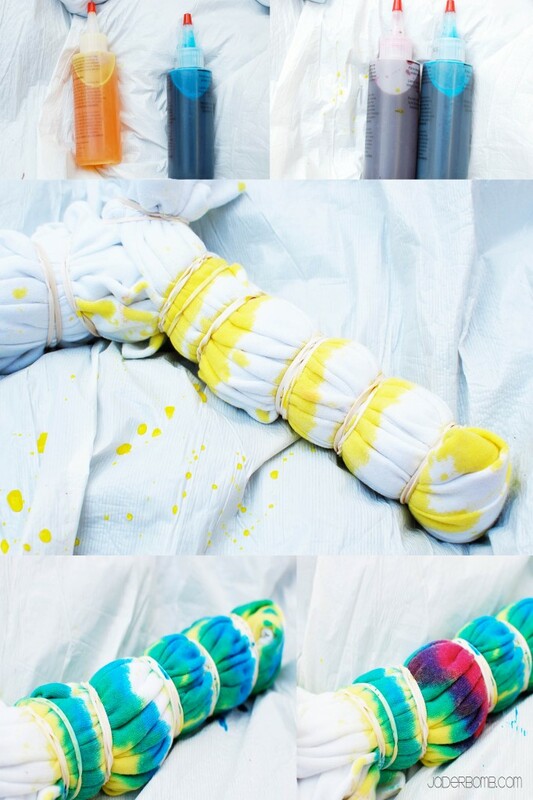 Let’s get started with our Tie-Dyed Pillow. This is what you will end up making. I like our bed to be completely white but every now and then it’s fun to give it a PUNCH of color! 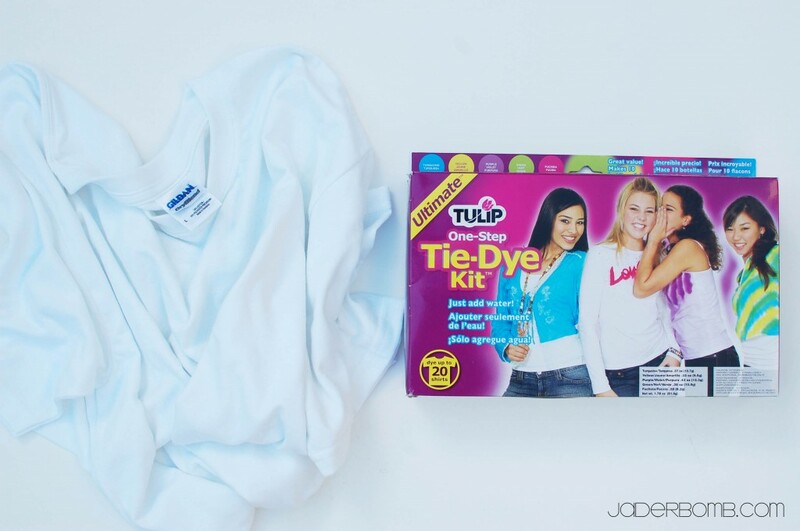 I used the Tulip one step Tie Dye Kit. 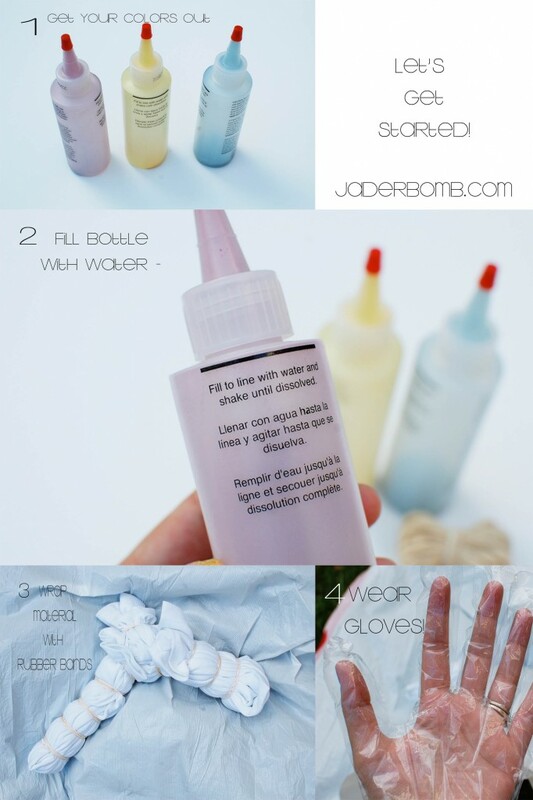 It’s super easy to do because the bottles already come with powder in them. All you have to do is fill them up with water. Make sure to stop at the line. You don’t have to wear gloves but your hands will be stained if you don’t. Be creative when you put your rubber bands. After all, the bands are the things that break up the color so make it fun! You can see I just started squeezing color onto my shirt in different spot. Remember that color chart from when you were a kid. The reason whey I want you to know this is because even if you only have a few colors you can make so many more by pairing them up with other colors. This is my favorite part. This is my mess when I was done. You want to let it dry outside over night or 7-8 hours. I did mine in the afternoon so checking on it in 7 hours would of meant me getting up in the middle of the night…. Well. I decided it wouldn’t hurt a few more hours, haha. When you let it dry rinse it out, then wash it. Don’t wash with other clothes. When you are done washing and drying lay your shirt out on a flat surface. Make sure you turn the shirt inside out. Lay your pillow down on top of the shirt. Get a piece of chalk and outline the pillow. 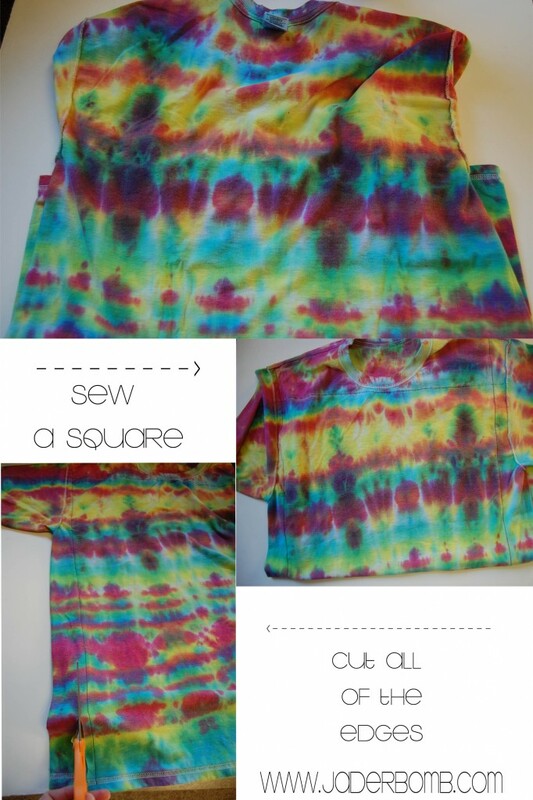 Sew all of the sides except one. Cut all of the edges then turn the shirt right side out. Stuff your pillow inside and then hand sew the side that we didn’t sew. I wanted to include this fun print for you. I thought it was so cute and perfect for this time of year! Sending you and yours and HUGE hug from my family to your’s….